Toxicity caused by exposure to pollutants from marine sediments is a consequence of the interaction between biota and xenobiotics most frequently released by anthropogenic activities. The present work intended to characterize the toxicity of natural sediments putatively impacted by distinct human activities, collected at several sites located in the south of the Gulf of Gabes, Zarzis area, Tunisia. The selected toxicity criteria were analysed following ecologically relevant test conditions. Organisms of the polychaete species Hediste diversicolor were chronically exposed (28 days) to the mentioned sediments. 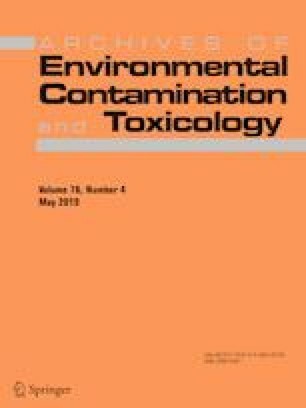 Toxicity endpoints were biomarkers involved in the toxic response to common anthropogenic chemicals, namely neurotoxic (acetylcholinesterase), anti-oxidant (catalase, glutathione peroxidase), metabolic (glutathione S-transferases) enzymatic activities, and oxidative damage (lipid peroxidation, TBARS assay). The chemical characterization of sediments showed that the samples collected from the site near an aquaculture facility were highly contaminated by heavy metals (Cd, Cu, Cr, Hg, Pb, and Zn) and polycyclic aromatic hydrocarbons (fluorene, phenanthrene, anthracene, fluoranthene and pyrene). H. diversicolor individuals exposed to the sediments from this specific site showed the highest values among all tested biomarkers, suggesting that these organisms were possibly under a pro-oxidative stress condition potentially promoted by anthropogenic pollution. Moreover, it was possible to conclude that individuals of the polychaete species H. diversicolor responded to the chronic exposure to potentially contaminated sediments from the southeast coast of Tunisia, eliciting adaptive responses of significant biological meaning. The authors are grateful to the “Erasmus Mundus Programme” for providing scholarship to R. Ghribi through the “Battuta” program (Building Academic Ties towards Universities through Training Activities) dedicated to the development of relations between Europe and North Africa through grants of excellence between the two regions. The authors are grateful to the Tunisian Ministry of Higher Education and Scientific Research also supported this thesis. This work was conducted in the framework of Researcher FCT Program (Operational Program for Human Potential, QREN, EU) who hired Bruno Nunes. The authors are particularly thankful to Prof. Abdelmajid Dammak for his contribution to correct grammatical errors and to improve the English writing skills of this paper. This research was also supported by the European Regional Development Fund (ERDF) through the COMPETE—Operational Competitiveness Program and by national funds through FCT—Foundation for Science and Technology, under the projects “PEst-C/MAR/LA0015/2013” and “UID/Multi/04423/2013” in the framework of the programme PT2020.